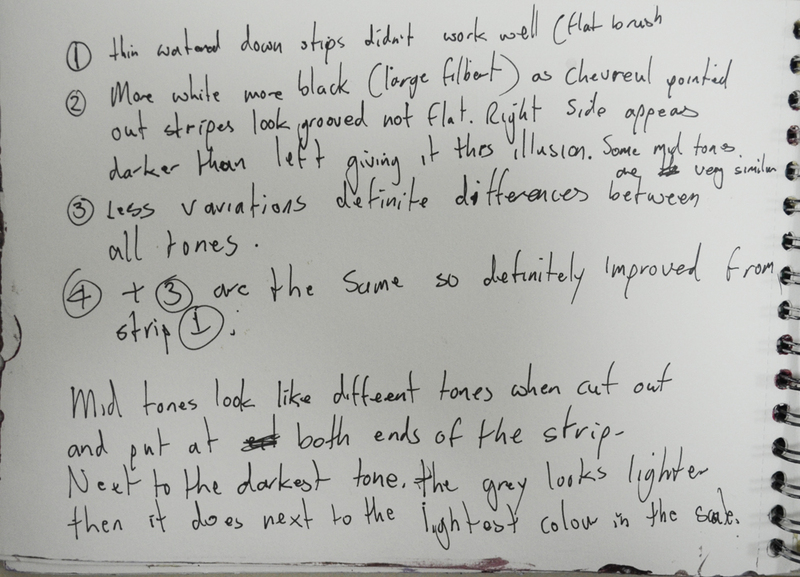 Start by mixing black pigment into white to create a tonal scale that is anachromatic (i.e. that has no trace of colour). Work up a series of narrow lines from white through the faintest of greys to darker greys until the darkest tone is straight from the black tube. Ensure that eaxch is thoroughly mixed and joined but not merged with each other. My first go at the scale was a mess I had been using water to dilute the paint so much in the last few exercises that it became a force of habit. After drying off the brush and cleaning my palette I made a second attempt which was much better but I felt that that there wasn’t a clear tonal progression and that the scale could be painted with less lines of tone with a more defined progression between each one. My third and 4th attempts did just this and were almost identical, so I felt no need to do anymore. After identifying the neutral grey between the black and the white and applied the same mix to to scraps of paper which I cut from the corners and once dry I placed them at each end of the scale. What I noticed was that the grey on the scrap of paper placed at the white end of the scale looked darker than the one placed at the black end of the scale. What I also noted from this anachromatic scale was a perfect example of the effect known as ‘Chevreul’s illusion’, the stripes seen from a suitable distance looked like channeled grooves rather than flat surfaces due to a doubling up effect caused by the left and right halves of each stripe looking lighter or darker due to the influenc at the edges of the preceding and following stripes. 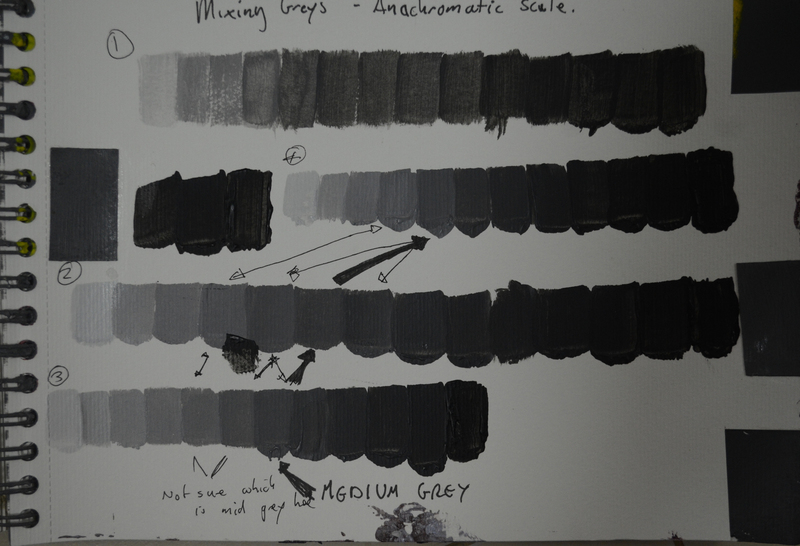 This entry was posted in 2 - Mixing Greys - Anachromatic Scale, Uncategorized and tagged Chevreul's illusiong acrylic paint, mixin anachromatic scale, mixing grey paints, mixing greys, oca painting 1 course on February 23, 2015 by Mark A Smith.